I took a break from Andrea Reads America to read The Goldfinch, the 756 page tome that was all the rage in 2013, for book club. Holy shizzle. By the final 200 pages you could barely pry the book from my hands. Set in modern day New York City, in an abandoned neighborhood development outside Vegas, and a little bit in Amsterdam, The Goldfinch is the story of Theo Dekker, son of an absent alcoholic dad and a stable, art-loving mom. At age 13, Theo is suspended from school, and as he and his mom kill time at an exhibit before meeting the principal, the museum is bombed in a terrorist attack. Theo survives, but his mother does not. In the rubble among the dead, there is one man who is still alive, though dying, whom Theo bonds with in the still settling dust of the aftermath. The man, an antique and art dealer, gives Theo a ring and tells him where to take it when he escapes the museum, and he insists that Theo take The Goldfinch, the masterpiece Theo’s mom had been admiring, off the wall – to save it from destruction, yes, but also because the painting pairs with Theo’s soul. The saga that follows is impossible to resist – PTSD, a 13 year old orphan living with a friend on Park Avenue, an alcoholic dad who whisks Theo off to Vegas, a friendship with a Russian boy named Boris, drugs and drugs and drugs, and always the painting, tugging, gripping Theo in its clutches as surely as alcoholism grips his father, as opiate pills grip Theo, as the chain grips the little yellow goldfinch to the wall. The Goldfinch is dark alleys and golden sunlight, it is the constant grapple with who is good and who is bad, who is the right one to love, who is the wrong one; it is about how can I be any other than who I am. The Goldfinch made me want to be reckless. It made me grateful that I’m not. It gave me a new favorite character – Boris – though in real life I would never feel safe with him. The Goldfinch is art and sublimity. It is about being shackled to things against our will – objects, memories, addictions, genetics – and finding beauty in the darkness. In it, Tartt captures the addict perfectly – the distortion between the addict’s internal world and his external actions, his justifications, his own belief that he is good even while he is behaving badly, the lying, the covering up, the brilliant high, the tar black low, the emotional depths, the passion for who and what he loves, the aspiring to great ends via shady, ugly means. The Goldfinch, as any great art will do, showed me a life I’ll never know while making me see my life differently. The thing about this book, aside from Tartt nailing the the struggle of the addict, the wrestling with trying to be good while knowing you are acting badly, is that Tartt shows us we can never escape who we truly are, and what can we do about that? Wow, that’s a beautiful book review! Your writing is outstanding! I readThe Goldfinch over our summer break and loved it so much I am going to suggest it to my book group. I remember enjoying Donna Tartt’s first book The Secret History, and then having to wait ten years for her second The Little Friend. Finally, another ten years later there’s The Goldfinch. She’s such a brilliant writer, it’s a pity she publishes so infrequently. That said her novels are worth waiting for. Thank you for your wonderful review. 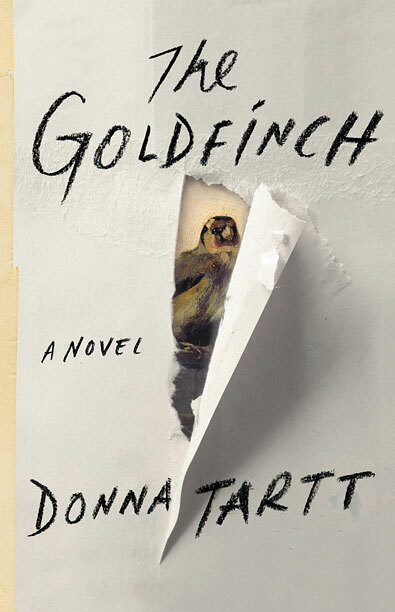 I kept hearing about The Goldfinch and Donna Tartt over and over again last year; I had never read any of her work, and while I was intrigued by what I was hearing about The Goldfinch, the length put me off. I am thrilled my book club picked it because otherwise I might never have read it. I’m glad I bought it instead of borrowing – I think it will be one to come back to. I appreciate your feedback about your love for her – now I really want to read The Secret History. Andrea, your review was so compelling that I went looking for The Goldfinch at our Huron Library. No luck. But they do have The Little Friend (Knopf, 2002) and think I’ll take a crack at it. She opens with a quote from Aquinas: “The slenderest knowledge that may be obtained of the highest things is more desirable than the most certain knowledge obtained of lesser things.” Got me right there! I hope you love it, Kurt. Most of the reviewers I heard just gushed about Donna Tartt and her masterpieces that have come before. It takes her a long time to write a novel – ten years between each one – but it’s obvious that time is well-spent in perfecting her work. Enjoy!